On 21 March 2013, An Post issued a new stamp to mark the 50th anniversary of the Irish Cancer Society. According to the National Cancer Registry of Ireland (NCRI), roughly one out of every three people living in the country will develop one of the more than 200 different types of cancer at some stage in their lives. However, due to advances in medical science, the fact that more and more people are prepared to make lifestyle changes and the tremendous efforts of the Irish Cancer Society, 42% of men and 50% of women diagnosed with cancer can now hope to survive for a further five years and, in many cases, even longer. The Irish Cancer Society began life in 1963, when Professor Austin Darragh, a highly regarded Irish physician, discovered that too many people were dying every year from a curable form of cancer. Professor Darragh realised that if people better understood their condition, their chances of survival were greatly increased. Providing critical information on the prevention, detection and treatment of cancer is one of the cornerstones of the Irish Cancer Society’s mission. The charity also provides support for cancer sufferers, and is by far the largest voluntary contributor to cancer research in the country. Another important aspect of the Irish Cancer Society’s work is in the area of advocacy. Working with the Government, the charity has spearheaded a number of vital cancer screening programmes, designed to facilitate the early detection of certain cancers, thereby increasing the chances of a full recovery. To mark the 50th anniversary of the Irish Cancer Society, An Post is issuing a new stamp designed by Red Dog Design. 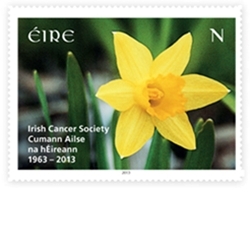 The stamp depicts a bright yellow daffodil – the iconic symbol most people readily associate with the Irish Cancer Society.